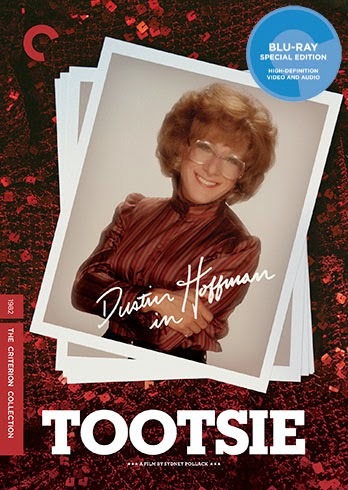 It's easy to understand why Academy voters were so enamored of “Tootsie” (1982). A comedy about hard-working yet constantly unemployed and underappreciated New York actors struck a familiar chord with the majority of the constituency, enough so that they showered the film with ten nominations, unusual for a comedy. That it only took home a single trophy (Jessica Lange for Best Suporting Actress) is a reminder that there's still nothing the Academy loves more than a stately historical epic as “Gandhi” was the big winner of the night. Perhaps the film's appeal was enhanced by stories of its long and tortured production. Based on a play by Don McGuire, the project had already passed through several hands before coming to the attention of actor Dustin Hoffman. Hoffman, at the height of his influence after an Oscar for “Kramer vs. Kramer” (1979), assumed creative control of the project. It remained in development for a few years before Hoffman brought in a new collaborator in director Hal Ashby who was later dumped by Columbia Pictures in favor of director Sydney Pollack. The script, meanwhile, is officially attributed to Larry Gelbart (of M*A*S*H fame) and playwright Murray Schisgal but was also the product of contributions by filmmakers Elaine May and Barry Levinson among others, including Pollack. Perhaps the potpourri of writing influences explains a minor oddity in the screenplay. Most Hollywood scripts rely heavily on careful planting and payoff; you set up an element early and then deliver on it later; it creates a pleasing sense of unity and avoids confusing viewers. 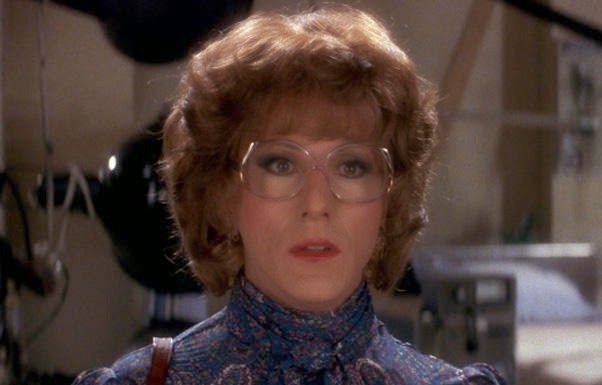 In “Tootsie” the major plot twist comes almost out of nowhere. Frustrated actor Michael Dorsey (Hoffman) is tired of earning a meager living as a waiter and occasional acting coach but he receives little support from agent George Fields (Pollack, in a feisty turn in front of the camera) who informs him that his reputation is so toxic that nobody in New York (or anywhere else for that matter) will employ him. One quick cut later and suddenly macho Michael Dorsey has become the bewigged Dorothy Michaels strutting awkwardly in high heels along a busy New York street. An opening shot showing Michael preparing for a role (as a man) by applying makeup vaguely plants the idea, but the switch here is remarkably abrupt; the idea of crossdressing has not even been mentioned. Maybe Hoffman, Pollack and crew figured the posters would provide all the set-up they would ever need. I find the story pretty uninvolving but the film benefits from an exceptional supporting cast. In addition to Lange, who really shines, there are excellent turns from Teri Garr as an insecure actress mistreated by Michael, the always reliable Dabney Coleman as the obnoxious ladies' man director, Bill Murray as Michael's bemused roommate, Charles Durning as Dorothy's would-be paramour, and George Gaynes as the vain but good-natured aging male lead of the soap. Geena Davis doesn't get to do a lot in her debut role except to look incredibly gorgeous. On the downside, two prominently featured songs by Stephen Bishop are, um, very '80s, and I wish you luck with them. I'm not sure what else to say. A few laughs, good acting all around. It's pleasant enough though the humor is pretty safe in a sitcom fashion, designed not to risk offense. The AFI was moved to select it as their second funniest film of all-time which is baffling to me, but your mileage may vary. The film is presented in its original 2.40:1 aspect ratio. According to Criterion, “this new digital transfer was created in 4K resolution” and it looks fantastic all around. Image detail is sharp throughout, colors are rich, and there's a fine grain structure giving the movie a vividly filmic look. I can't think of any complaints. The linear PCM mono track is clear and distortion free. All dialogue is clearly mixed and the music sounds surprisingly dynamic for a mono mix. Optional English subtitles support the English audio. The disc also includes two “Making Of” features.” First is an on-set feature shot by director Rocky Lang (1982, 34 min.) Second is the lengthier “A Better Man: The Making of 'Tootsie'” (2007, 69 min.) directed by Charles Kiselyak and incorporating some footage from Lang's feature. I have only briefly skimmed both of these. Criterion has also included nine Deleted Scenes running 10 minutes total. They are fully edited with sound but were not used at all in the final cut. We also get two screen/wardrobe tests. 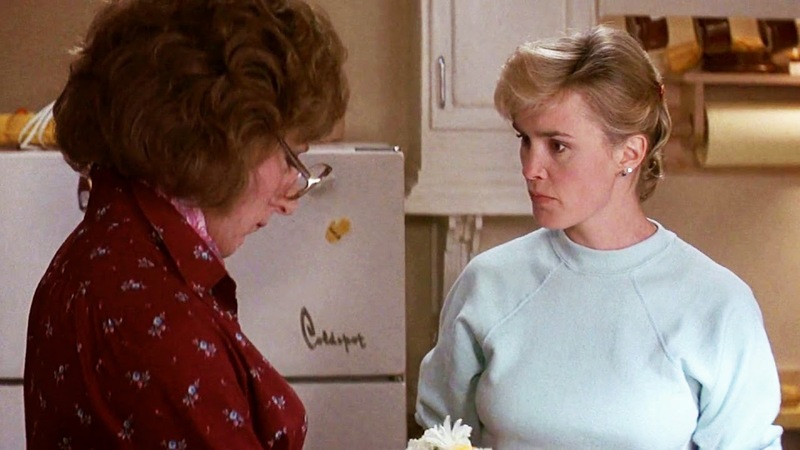 The first features Hoffman in character (Dorothy is a nurse at this juncture) being interviewed by an off-screen Hal Ashby. Second is silent footage of Hoffman on set dressed as nurse Dorothy. These two tests run 7 minutes total. The extras conclude with three Trailers, running 3 ½ minutes total. The fold-out insert booklet feature an essay by critic Michael Sragow. The AFI loves it. I think it's... fine. You make your own call. This Criterion release features a splendid high-def transfer and a solid collection of extras so if you want the movie, this is the one to buy.